I went to the casino today and it happened again. I got two of my bills back. When I looked them up on my cell phone, I saw that they had been entered in late February of this year. I put them back into the machine. I’m hoping that it won’t be another four months before someone gets them and takes them home. I’m wondering if I’ve reached a saturation point. It might be time to move on to fives and tens. I found another interesting marking on a bill. A Google search reveals First Victoria National Bank as a likely suspect. 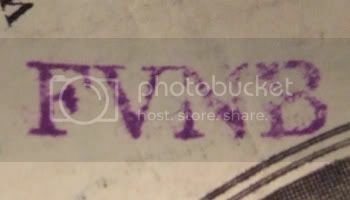 I’m guessing that that’s where the stamp came from, considering that it’s not unusual for banks to stamp a strap of bills, leaving some mark on the top of the bill. The odd thing is that the stamp doesn’t appear to be part of a larger stamp. I’m wondering if someone just had a stamp that the had to use or if this was a common procedure. In other news, my brother and sister-in-law got mentioned in a New York Times Article. (My brother is Brice Kuhl in case you wanted to skip to where my brother was quoted…) It looks like I’m the only one of the three brothers not to have a newspaper article about them. There’s still plenty of time, though.